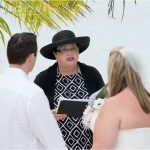 DIY Brides Can Enjoy a Cayman Destination Wedding Too! 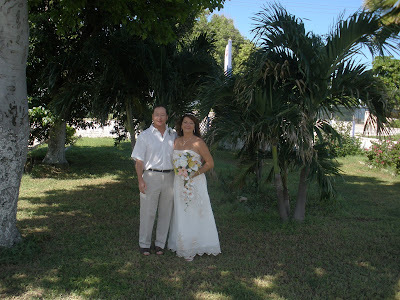 What's a Caribbean wedding without palm trees? 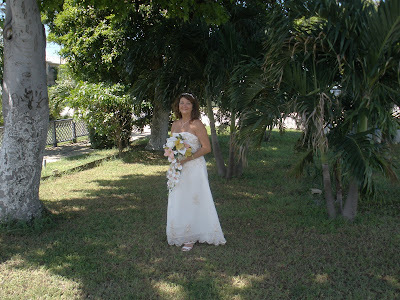 Here the bride stops for a quick pose in the Simply Weddings garden once she has dressed in our Bridal Room. The bride had the bridal bridal bouquet and boutonniere made and brought them with her. She also bought and decorated her own champagne flutes. 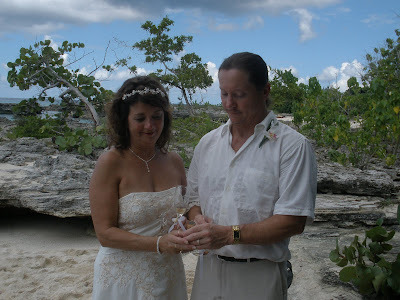 Even her garter was decorated with a seashell. 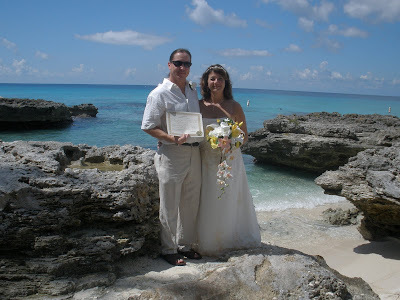 This couple had chosen MSC over Seven Mile Beach, and they were not disappointed. They kept saying they recognised things from my blog. 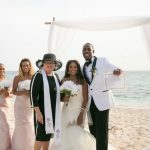 They met their witnesses, from Washington DC on the cruiseship and brought them along to complete their special day, with special new found friends. A quiet pose on the rock-bench shows off the bride's very appropriate gown. Here they are looking at their cork. 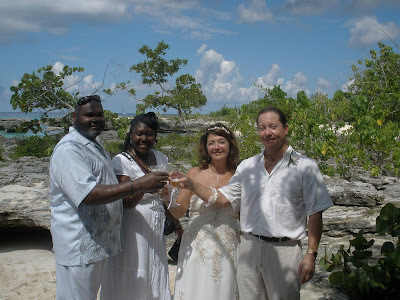 I'm sure the bride, who took their Simply Weddings Bubbly (empty) bottle back to the ship will find some creative way to use another souvenir of their wedding-moon. 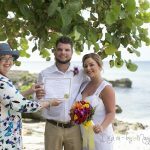 Since Cayman was the last stop on their cruise, they joked they had had the honeymoon first. This is the ledge I get my couples to stand on, because I like this particular shot of the little cove with the waves coming in. This is really a very intimate, private setting for a wedding, and you will understand when you see it why I don't allow more than 5 -6 guests. 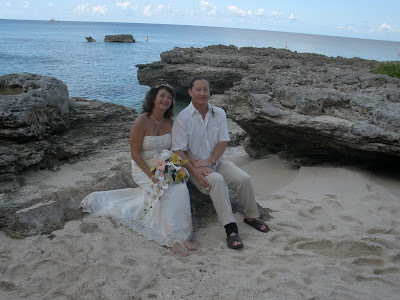 It is really one of my favourite spots in the Cayman Islands, and one of the prettiest. 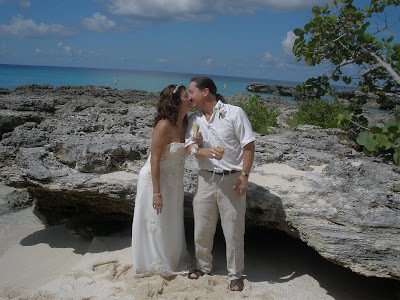 So if this setting is your idea of perfection for you Cayman Beach Wedding too, ask for "My Secret Cove." 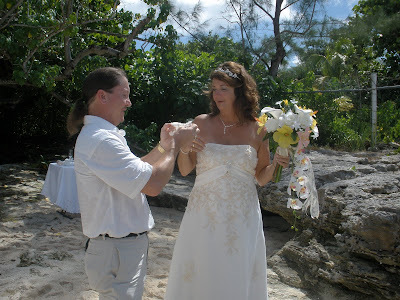 Call Simply Weddings today to schedule your own perfect Cayman Wedding. We take pride in our islands, and the service we provide to our guests. 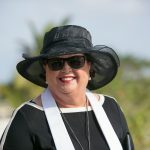 Call Joy or Peggy today +1 (345) 9499933.